I woke up to a thunderous announcement on the flight. Two for the price of one drinks – an exclusive deal for Ryanair passengers. Reminiscent of a second-class, three-tier train journey through India, I thought. Where cries of “Chai, Chai, Chai Garam”, literally tea, tea, tea hot start, at the crack of dawn. Still, the Â£10-a-ticket paying customers did have their standards. “It’s bloody outrageous to have advertising on the flight!” he barked at the air hostess. I wondered who he thought should pick up the actual cost of his ticket. I tried another tack.Your passengers aren’t actually deaf. This was promptly followed by a booming advert for prize draw tickets. Fresh from the glow of winning a competition by one of my favourite bloggers, I was on fire. Clearly it was time for me to raise the stakes on my naan-making abilities before I fell for any hare-brained, money making schemes. So back from my gorgeous break in Venice and north Italy, I made a quick phone call to mother, her aunty, and rolled up my sleeves. Guess what? They came out perfect and used ONLY THREE main ingredients and no yeast! Look like I have the winning ticket for pretty perfect naan. NOTE: For all of you whose patience I have tested with endless holidays, I am now penniless and thus unable to take any more hiatus until late 2008. Heat the soda water in the microwave for a minute. Sift the flour into a large mixing bowl with a fine sieve. Add to it the salt and nigella seeds. Then pour half the soda in and crumble the dough mixture. Slowly add in the rest of the soda water in and mix it into the flour with your hands. When the soda is evenly incorporated into the flour, start punching it with your knuckles over and over again in a rolling motion. If the dough feels sticky to the touch, you could add a teaspoon of flour to it. Ultimately, you will get a pliable dough and that spings back when you touch it. Of course you could just do all of this with a dough hook. Now, transfer it to a bowl greased with the oil. Cover it with a clean, wet cloth and leave to sit somewhere warm. If it’s cold, you could just stick it in the oven turned to its lowest setting. After an hour, take the dough out and punch it well for two minutes. Then stick it back in the bowl under damp cloth. Another hour later, preheat the oven to 230 degrees centigrade. When it’s hot, line a baking sheet with kitchen foil. Roll the dough with your hands into a long, thick sausage. Break it into four equal parts. Fashion each part into a quarter inch thick tear shape and place on the sheet. Bake for about eight minutes. Then rub the golden brown top with butter until it melts all over and serve hot. If making more, you could add the butter and leave to sit wrapped with a clean cloth or some kitchen foil. Serve hot and freeze some for later like I did. Your Naan looks so good, Will try these this weekend, thnx for sharing Mallika! Thanks for sharing this, Mallika.. 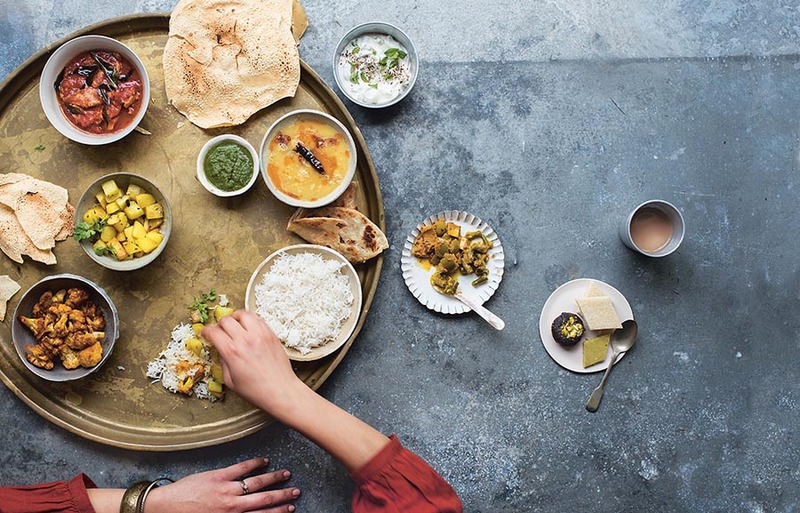 I keep planning to try making my own naan and never get round to it, because all the horror stories in the blog world scare me 🙂 But this is definitely very inspiring. One question..is soda water the same as tonic water? Thanks ladies. I myself have tried and failed with different recipes. The trick is to punch the life out of the dough with your knuckles. Sonal – Soda water is carbonated water with sodium bicarbonate. Usually, you find them in the same aisle shelf as tonic water but they aren’t the same thing. I never thought it is so easy to make nans. Only thing I changed is, I used a pizza stone which saw in Mrs.Manjula’s recipe. So how was the vacation ? Where are the pics ? Naan is not my cup of tea, all things that need to be rolled out are actually not my cup of tea. wow, I’m honoured! Thank you! speaking of which, can we have a roti recipe? 🙂 I tried making roti once, and they turned out all rubbery, and only just edible! Your very first attempt turned out just perfect mallika, Those naans looks so better off then the soggy, stretchy supermarket ones!!! I am will definitely give it a try!! Hi First time on your blog and just loved it. And this naan looks perfect !! Hi ..First time on your blog and loved it. This naan looks just perfect !! Mallika, congrats on the award, that’s wonderful. You’ve been cooking up a storm… zafrani ghost, naan.. simply droolworthy! those look great….now whats the confusion!..your blog is coming clicking something else! Amazing recipe… loved it…. do u need to make the naan on a stone or can we just bake it on a gril or rack or a big pizza plate?? I’ve never used soda water when making naan – will definitely be trying that out. Thanks for the tip! lovely naan…thanks for the recipe!!! That’s a wonderful recipe Mallika! thanks for sharing! WOW! first time??? these look awesome! Thanx for sharing the recipe. You have a very nice blog. Its a very nice recipe. And a very nice collection of recipe. Looking forward to see more recipes from you. can u suggest an alternate for micro oven? Induction cooker, gas stove… with this is it possible to make it easy and fast? This is my first time here. I loved it. Those nans look great. Have to give it a shot! Too good to resist. 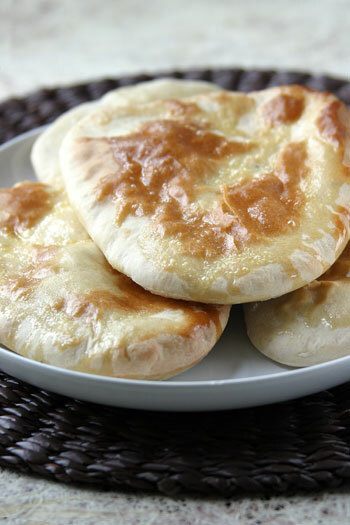 Just made(and ate)naan…can I just say wow! A great easy recipe to make on a lazy Sunday afternoon; I’ll be making this naan again. Making naan for the first time (in an oven with a pizza stone), and I tried two recipes side by side: yours and one calling for yogurt. And this recipe makes the most beautiful dough I’ve ever worked with. The flavor it perfect. I am taking a while to get the right thickness, but that’s to be expected. I am, however, getting a slick, plasticky crust on the bottom from the pizza stone. Has that ever happened to you?